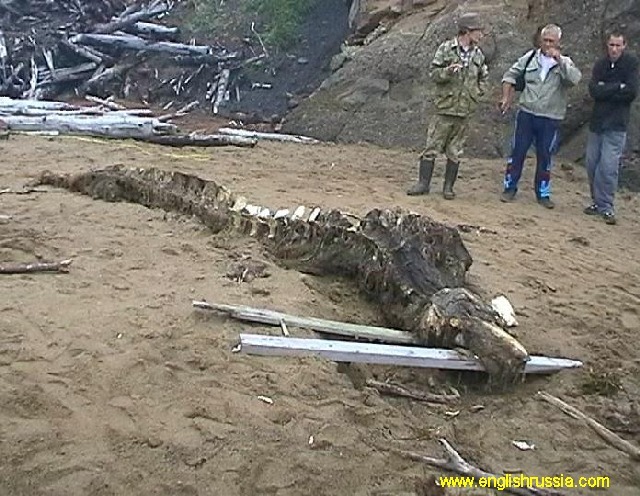 This creature was found by Russian soldiers on Sakhalin shoreline. Sakhalin area is situated near to Japan, it’s the most eastern part of Russia, almost 5000 miles to East from Moscow (Russia is huge). People don’t know who is it. According to the bones and teeth - it is not a fish. According to its skeleton - it’s not a crocodile or alligator. It has a skin with hair or fur. It has been said that it was taken by Russian special services for in-depth studies, and we are lucky that people who encountered it first made those photos before it was brought away. 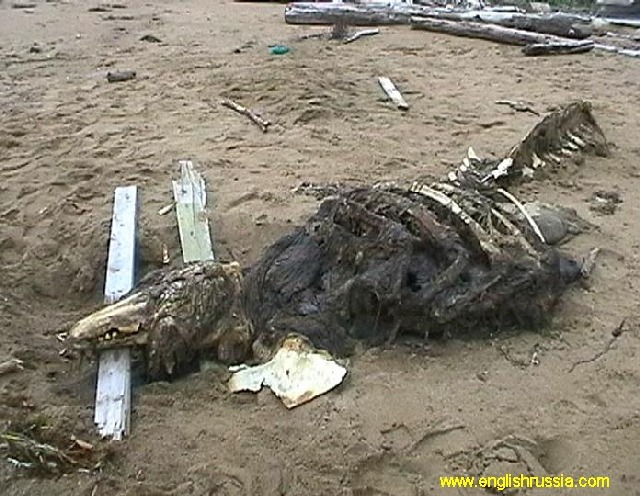 The cryptomundo.com website noted that the story has changed somewhat, "as it was originally reported that the carcass was found by Russian fishermen, whereas here it was reportedly found by Russian soldiers. The initial description mentioned that the carcass was nearly 7 meters long, approximately 21 feet. It doesn’t appear to be that length in these photos." This case is rather easy to dispatch. Enough of the skull and skeleton is visible to say that it is definitely a small-toothed whale, and almost certainly a beluga whale. The skull shape, dentition, and other details are all consistent with a large beluga whale. 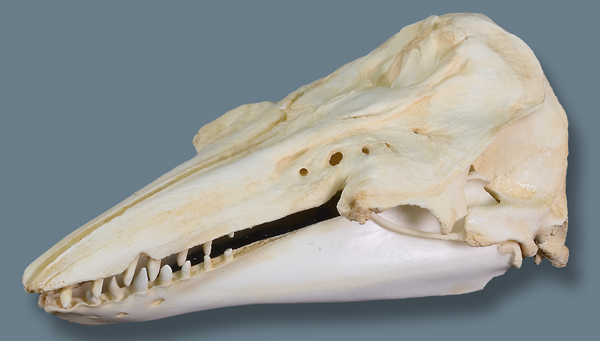 Shown here is a photo of a beluga whale skull for comparison. Any differences are readily accounted for by the liklihood that the carcass represents an old, robust individual whose teeth are worn and broken (and in the front, missing). The vertebrae and exposed scapula are also whale-like. The neck is also short, and and there are no hind flippers visible to suggest a plesiosaur. The dark "hair" undoubtely represents decayed flesh, which typically becomes darker and fibrous as it decomposes. Although the carcass was reported to be 21 feet long, judging by the people standing near the carcass, a more realistic estimate would probably be 12 - 15 feet long, which is within the range of beluga whales.